Concrete floor coatings in data centers eliminates dust contamination on the concrete floor. Bare concrete or unsealed concrete floors can flake and spall over time emitting dust particles into the air becoming hazardous to sensitive equipment as well as the facility. Sealing a concrete floor should be standard practice in a data center environment, especially to control static electricity. includes ESD or static protection. Static buildup can damage sensitive electric equipment. a slight slope ensuring any potential liquids stay away from electronic equipment. is cleaned regularly to keep dust to a minimum ensuring efficiency of your equipment. Sealed concrete floors always looks great and is easy to clean. Contact Concare today to evaluate your data center concrete floor. 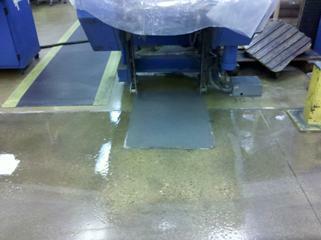 Concrete floor coating for the electronics industry is critical for the protection and safety of the work environment. Contact Concare for a complete evaluation of your flooring system.